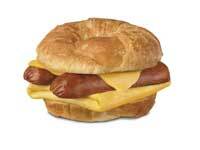 Carl's Jr. has expanded their breakfast menu with the new Smoked Sausage Breakfast Sandwich. The sandwich is "a split Hillshire Farm smoked sausage link, a warm, folded egg and a melting slice of American cheese served on a flaky croissant." The Smoked Sausage Breakfast Sandwich has 610 calories, 45 grams of fat, 18 grams of saturated fat, 29 grams carbs, 295 mg cholesterol, 1330 mg sodium and 23 grams of protein. I can officially say that this sandwich looks disgusting!! !